In Wednesday’s paper, we show how recruiters are using Twitter to source and connect with job seekers, in addition to other social networks such as LinkedIn and Facebook FB -2.98%. But the future of social recruiting may also involve using location-tracking apps that let recruiters know when potential candidates are nearby. Take Jocelyn Lai, a talent acquisition manager for Austin, Texas advertising firm GSD&M. Lai says she gets some of her best recruits by using the location-based mobile app Highlight, because the program is used by the type of “early adopters” her firm seeks. Every time she’s on business trips to New York and Chicago, she’ll take a cab during the workday around areas where many creative agencies are located. If people working nearby also have the Highlight app on their mobile phones, she’ll get a notification. Using the app, she’ll collect names of potential contacts and will send a message, either via Highlight, Twitter or LinkedIn, to those who look particularly promising. 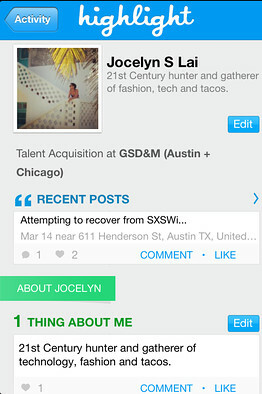 She also uses Highlight to capture potential candidates during conferences, such as Austin’s SXSW interactive. Readers, what’s your take on location-based recruiting? Creepy or cool?